In the classic days of Saturday and Sunday morning cartoons, "The Rocky and Bullwinkle Show" used to be a favorite among the older generations. Along with the likes of "Looney Tunes," children used to laugh along with the zany antics of these iconic characters. But there was a little-known segment included in "Rocky and Bullwinkle" that is getting the modern-day treatment: "Peabody's Improbable History." Getting its first run in the 1960s, these cartoons are now hitting the silver screen this month. Retitled as "Mr. Peabody and Sherman," the updated science fiction film follows the adventures of Mr. Peabody, an intellectually advanced canine, and his adopted son Sherman. Using his WABAC machine, the pair travel through time to witness world-changing events unfold in front of them and interact with famous characters from history. However, when Sherman breaks the rules, they have to replace a rift in time to save the future. While its rating is appropriate for children, there might still be some scenes that aren't 100 percent child-friendly. There's some minor rude humor sprinkled throughout the film, as well as some action-packed scenes. Although it's an animated film, your kids may get frightened from the activity, so be prepared to possibly deal with some moments of fear. Regardless of the minor instances of potty humor and scary thrills, "Mr. Peabody and Sherman" is a movie that's acceptable for kids of all ages, provided you're present at the viewing as well. There's a lot of information about time travel and the various paradoxes that can arise, based on scientific theories. While it may seem initially confusing, the movie does a good job of making the subject matter understandable for all audiences – you may not follow it that well yourself! Additionally, there's a good father and son relationship between the main characters that should be entertaining for many. There are also a lot of history lessons, which would normally get covered during a younger child's social studies classes. It could even be beneficial to his or her learning. The voice acting from Ty Burrell ("Modern Family") and Max Charles ("The Three Stooges") is excellent, and so is the animation from DreamWorks. 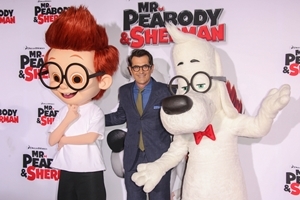 In the end, it looks like "Mr. Peabody and Sherman" will be another animated hit with the kids. It's such a fun and enjoyable film, you may even get a few good laughs in too.